Used, rebuilt, reconditioned, remanufactured and new Kawasaki motorcycle starter motors, save up to 70% on motorcycle used parts! We sell used, rebuilt, remanufactured and some new Kawasaki Motorcycle Starters for most years, including vintage "hard to find or discontinued" starters at substantial savings. We offer a FREE PARTS LOCATING SERVICE if you don't find the starter you need. Simply complete our Motorcycle Parts Request Form below. We are the industry leader for locating used motorcycle parts including used, rebuilt and some new Kawasaki starters, motorcycle electrics or electrical parts for street bikes, dirt bikes, ATV & sport bikes. Motorcycle starters are also available for Honda, Suzuki and Yamaha. We are linked to several motorcycle salvage warehouses throughout the United States with over 1 million used motorcycle parts available. If we don't have your part or starter, our sales staff will help you find your motorcycle parts or starter (used, rebuilt, remanufactured or new) at the best price. Why spend hours searching for your motorcycle starter or used parts when you only have to make 1 phone call or send us a email request for a motorcycle starter or parts. We are one of the most trustworthy company's on the internet and have been in business for 34 years. See what our customers say about us, please read our Testimonials. Whether you are looking for a used motorcycle starter or motorcycle part, we can help with great prices and a guaranty! With our 34 years of experience, we are confident we can help you save time and money! Nothing like competition to keep prices reasonably low, saving up to 70% on used motorcycle starters and motorcycle parts. Remember, if we don't have your starter or part in stock today, it doesn't mean part won't be available tomorrow! * Weekly specials on used motorcycle starters and used motorcycle parts. * Save up to 70% on used starters and motorcycle parts for Honda, Kawasaki, Suzuki & Yamaha. * Access to over 1 million used, new & rebuilt motorcycle starters including motorcycle parts. * "FREE" Motorcycle Parts Locating Service for motorcycle starters & used parts including electrical parts. * Many years in business assures great customer service & prices, with no BS unlike many other sellers especially on eBay (buy at your own risk). * All used motorcycle parts are guaranteed to be good and correct. New or rebuilt motorcycle starters have a 1 year pro-rated warranty, with exchange for your good rebuildable core starter, unless specified otherwise. * Worldwide Daily Shipping: UPS • USPS • FED EX. Please allow 4-7 working days for normal ground delivery in the U.S. We do offer expedited shipping services if requested at additional costs. We accept all major credit cards, Paypal, money orders and cashier checks. Used starters or parts may have nicks, scratches or minor dings that were not described or noticed but will not affect the operation or fit. Keep in mind your purchasing a guaranteed good "used part" not new unless stated otherwise. * Please confirm availability and price including shipping cost before purchasing a motorcycle starter or part not listed on site. Used parts prices can change daily even if it's the same product because of the many variables that go into pricing parts, such as price a particular warehouse originally paid, condition and each warehouse (over 200) prices their products different. If we quote you a price for a item and you decide to wait, that item could have been sold and the next similar item will be priced different, more or less money. If you leave a deposit or purchase when we quote price or select "Buy Now" when applicable, that part is yours at the quoted price. We reserve the right to change prices anytime because that item is no longer available. We try to get you the best deal at the time of inquiry so don't wait if you want to purchase, price could change. * "CONTACT US" before purchasing a used motorcycle starter or parts from another motorcycle shop, we will do our best to save you money and time. * There is a 25% restocking fee plus shipping cost for the return of parts. We will not accept any merchandise returned without our written authorization return approval. 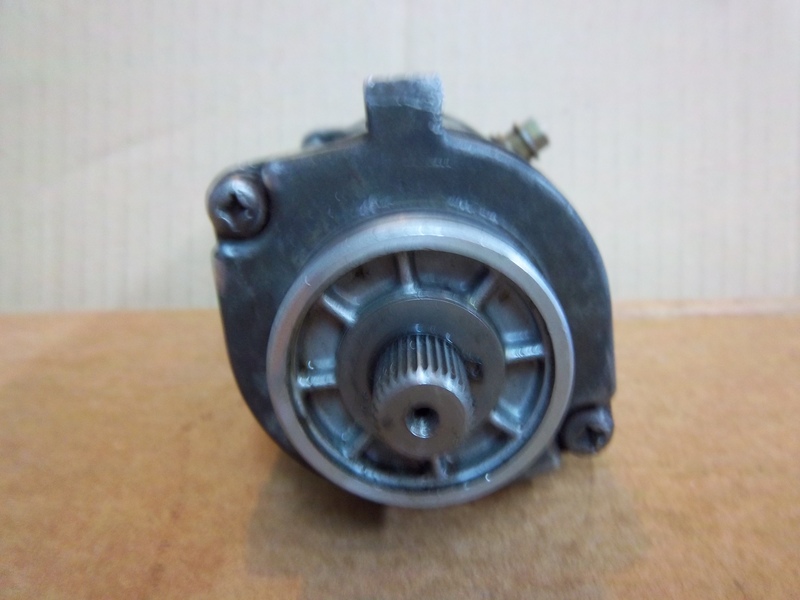 Kawasaki motorcycle used starter motors are available for EX250, EX250 Ninja, EX 250, EX500 Ninja, EX 500, EX500A, EX 500 A, EX 500D, EX500D, EX 500 D Ninja, ZX600, ZX600A, ZX 600A Ninja, ZX600R C, ZX600C, ZX 600 C, ZX6C Ninja, ZX6E, ZX6D, ZX 6D, ZX600D, ZX 600D Ninja, XZ6R D, ZX 6R D, ZX600E, ZX 6E, ZX600 E, ZX6R, ZX6, ZX600R J, ZX6R J, ZX-6RR, ZX6RR, ZX 6R Ninja, ZX600R F, ZX6F, ZX 6F, ZX6R F, ZX600RF, ZX 6G, ZX 6 G, ZX6R J, ZX6J, ZX 6R J, ZX6RJ, ZX636, ZX 636, ZX636 Ninja, ZX750A Ninja, EX 650E Ninja, EX 650, EX650, EX650A, EX 650A, Ninja EX650, ZX 750A, 750 ZX A Ninja, ZX 750E Turbo, ZX750E, Turbo, ZX750E, ZX-750F, ZX750F Ninja, ZX 750F, ZX750, ZX7, XZ 7,ZX7J, ZX 7J Ninja, ZX7K, ZX 7K, ZX7K Ninja, ZX7L, ZX 7L, ZX7L Ninja, ZX7P, ZX 7P, ZX7 P Ninja, ZX 9, ZX900A, ZX900 Ninja, ZX 900, ZX9E, ZX 9E, ZX-9E Ninja, ZX9 F, ZX9F Ninja, ZX9C, ZX 9C Ninja, ZX900E, ZX900C, ZX1000R Ninja, ZX 1000R Ninja, ZX 1000, ZX1000, ZX1000A Ninja, ZX1000A, ZX1000C, ZX1000D, ZX10, ZX10R, ZX 10, ZX 10R, ZX10R Ninja, ZX 1100, ZX1100E, ZX 1100E GPZ, ZX1100E GPZ, ZX 11E GPZ, ZX11, ZX 11, ZX1100, ZX 1100, ZX11C, ZX 11C, ZX1100C, ZX 1100C, ZX11D, ZX 11D, ZX1100D, ZX 1100D, ZX12A, ZX 12A, ZX12, ZX 12B, ZX12B NInja, ZX12C ZX 12C, ZX12R, ZX14, ZX 14, ZX14R, ZX 14R, KZ250, KZ 250, KZ250D LTD, KZ250D, KZ 250 LTD, KZ 250 D LTD, KZ305, KZ 305, KZ400, KZ 400, KZ400D, KZ 400D3, KZ400A KZ 400A, KZ 440, KZ 440A, KZ400B, KZ 400B, KZ400D, KZ440 LTD, KZ 440LTD, KZ440B, KZ 440B, KZ 440D, KZ440 Belt Drive, Belt Drive KZ440, KZ550, KZ 550, KZ550A, KZ 550A, KZ550d KZ 550D, KZ550 GPZ, GPZ 550, KZ650, KZ 650, KZ650B, KZ 650B, KZ650C KZ 650C, KZ650E, KZ 650E, KZ650E LTD, KZ 650E LTD, KZ650H, KZ 650H, KZ650H CSR, KZ 650H CSR, KZ750, KZ 750, KZ750B, KZ 750B, KZ750G, KZ 750G, KZ750H, KZ 750H, KZ750L, KZ 750L, KZ750M, KZ 750M, KZ750M CSR, KZ 750 CSR, KZ 750M, KZ750 Twin CSR, KZ900, KZ 900, KZ900A, KZ 900A, KZ900B, KZ 900B, KZ1000, KZ 1000, KZ1000A, KZ 1000A, KZ1000A Shaft Dive, Shaft Drive KZ 1000, KZ1000M CSR, KZ 1000 CSR, KZ 1000 SHAFT DRIVE, KZ1000P, KZ 1000P, KZ1000 Police, KZ 1000 Police, KZ1000A, KZ 1000A, KZ1000B, KZ 1000B, KZ1000B LTD, LTD KZ 1000, KZ1000K, KZ 1000K LTD, KZ1100, KZ 1100, KZ1100B, KZ 1100B, KZ1100 GPZ, KZ 1100 GPZ, ZL600, ZL 600, ZL600 Eliminator, ZL 600 Eliminator, ZL600A, ZX 600A, Elimintor, ZL900, ZL 900, ZL900 Eliminator, ZL 900 Eliminator, ZR550B, ZR 550B, ZR550, Zepher, Zephyr, ZR7, ZR750, ZR 750, ZR750 Zepher, ZR750 Zephyr, ZR750C, ZR 750C, ZR750H, ZR 750H, ZR7S, ZR 7S, ZR1100, ZR 1100, ZR1100C, ZR 1100C, ZRX 1100, ZRX1100, ZR1200, ZR 1200, ZR1200A, ZR 1200A, ZRX1200, ZRX 1200, ZRX, KL 650, KL650, ZZR600, ZZR 600, ZZR1200, ZZR 1200, KLR 650, KL 650, KLR650, KL650, EN450, EN 450, EN450A EN 450A, EN500, EN 500, EN500A, EN 500A, EN500C, EN 500C, KLX250, KLX 250, VN750, VN 750, Vulcan, VN750A, VN 750A, VN750A Vulcan, VN800, VN 800, VN800 Vulcan, VN800A, VN 800A, VN800B, VN 800B, VN800B Classic, VN 800B Classic, Classic, VN 800E Vulcan Drifter, Drifter, VN800E Vulcan, VN1500, VN 1500, VN1500 Vulcan, VN 1500 Vulcan, VN1500P Vulcan Mean Streak, VN 1500P Vulcan, Mean Streak, Meanstreak, VN1600, VN 1600, VN1600A Vulcan, VN 1600A Vulcan, VN1600A Vulcan Classic, VN 1600A Vulcan Classic, VN1500B, VN1500C, VN 1500C, VN1500C Vulcan, VN 1500C Vulcan, VN1500D, VN 1500D, VN1500D Vulcan, VN1500E, VN 1500E, VN1500E Vulcan Classic, VN1500SE Vulcan, VN1500G, VN 1500G, VN1500D Nomad, VN 1500D Vulcan Nomad, Nomad, VN1500R, VN 1500R, VN1500R Vulcan, VN2000, VN 2000, VN2000 Vulcan, VN 2000 Vulcan, ZG1000, ZG 1000, ZG1000A, ZG 1000A, ZG1000A Concours, ZG 1000A Concours, ZG1200, ZG 1200, ZG1200 Voyager, ZG1200 Voyager, ZG1200A, ZG 1200A, ZG1200 Voyager XII, Voyager, ZN700, ZN 700, ZN700A, ZB 700A, ZN700A LTD, ZN1300, ZN 1300, ZN1300A, ZN 1300A, ZN 1300 Voyager, ZN1300A Voyager, KH 500, KH500, KH 500 H1, KH500 H1, KH 500 H1 Triple, KH500H1 Triple, KH750, KH 750, KH750H2, KH 750 H2, KH750 H2 Triple, KH 750H2 Triple + MUCH MORE! Pictures of motorcycle starter motors might not be the exact starter you will receive and starters will have normal cosmetic wear. Used starters are tested and come with a 30 day warranty from purchase date. Rebuilt starters have a 1 year pro-rated warranty. Prices listed "do not" include shipping, handling & insurance fee of $8.75 to $17.75. International shipping cost will be extra (we will send additional cost after checkout). Shipping cost listed at checkout is for U.S. only (not overseas). Rebuilt starters listed require a refundable core deposit varying from $40-$75 (depending on particular starter) which is included in checkout price and core must be returned within 2 weeks to qualify for refund. Once your rebuildable core starter has been returned, core deposit will be refunded. If starter shown in pictures doesn't match up to your starter it will not work. We make no guaranty about starter interchange. Charts or possible compatible models listed are for reference purposes only. Send us email if you don't see your used, rebuilt or new starter below. We probably have a starter for just about any motorcycle or ATV! INTERCHANGE LISTED IS FOR REFERENCE ONLY, NO GUARANTY ON ACCURACY, ASK QUESTIONS AND LOOK AT PICTURES IF NOT SURE. 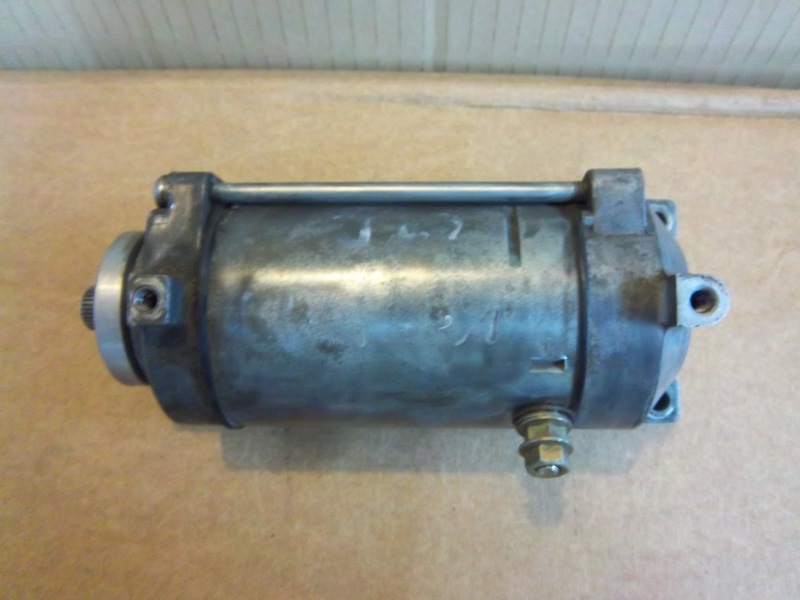 1982-85 Kawasaki OEM used starter motor for KZ 200, KZ 250, KZ250 LTD & KLT 250 Prairie. We also offer a after market new starter with end gear included and is sold outright, no exchange necessary. Used starters have a 30 warranty, rebuilt (with exchange). Another used motorcycle starter could be available and a rebuilt starter is available with exchange. 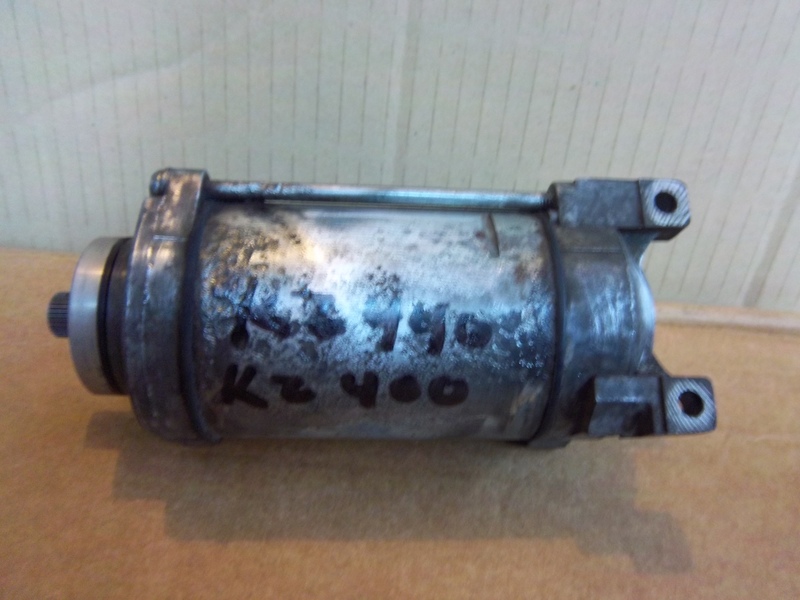 1987-88 Kawasaki OEM used starter motor for EX 305GPZ, KZ 305CSR & KZ305LTD with low miles. This starter is rare in this condition. Another used motorcycle starter could be available. 1986-87 & 1996-02 Kawasaki OEM "Rebuilt" starter motor for ZX600A, C, R and ZL 600 Eliminator. 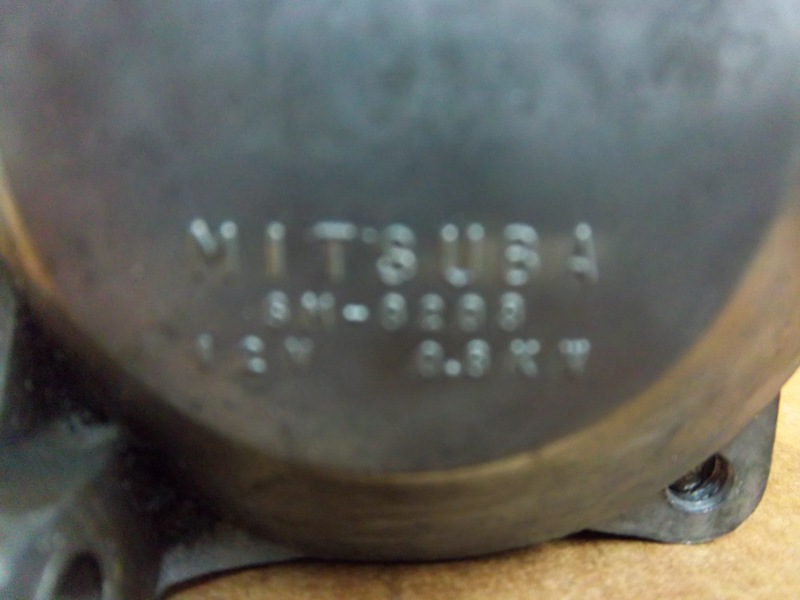 Stamped on end cap is Mitsuba SM-8. Starter comes with a 1 year pro-rated warranty and is sold with your good exchange for $89.95 or $109.95 outright + shipping. K60-216 ZX 750R Ninja 1987-90 Kawasaki "Rebuilt" starter motor which will fit 1987-1990 ZX 750R Ninja only and is a rare starter. Part # is 21163-1094 and 12800-3800. Starter comes with a 1 year pro-rated warranty and is sold with your good core exchange for $89.95 or $109.95 outright + shipping. K61-209R ZX 900 Ninja 1984-86 Kawasaki used and "Rebuilt" starter motors are available for ZX900 Ninja. This starter fits this model only. Used starters come with a 30 day warranty and rebuilt starters with a 1 year pro-rated warranty and is sold with your good exchange for $89.95 or $109.95 outright + shipping. 2002-05 Kawasaki OEM used starter motor that should fit ZG1000 Concours, ZL1000 Eliminator, ZX10, ZX1000R Ninja, ZR1100, ZX1100, ZX1100E GPZ and ZRX1200. See pictures to make sure it matches your starter and has Mitsuba SM-8 stamped on end cap. Price is always + shipping.